(1998) "Be Alone No More"
(1998) "A Million and One Quetions"
"Be Alone No More" is a song by British R&B vocal quartet Another Level. Written by Steven Dubin, Andrea Martin and Ivan Matias, it was released as Another Level's debut single from their eponymous debut album on 16 February 1998. A remix version of the song features American rapper Jay-Z. It was released a second time in 1999 together with a cover of the Simply Red song "Holding Back the Years". The two releases peaked at number 6 and number 11 in the UK respectively. The song was covered by British producers Philip George and Anton Powers with the title "Alone No More", released through 3 Beat Records in 2015. Powers had been toying with the idea of remixing the record for several years before meeting George who suggested it be a good idea. It debuted at number 4 on the UK Singles Chart and number 1 on the UK Dance Singles Chart. ↑ Baker, Ernest (2013-03-19). 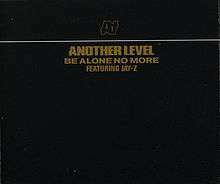 "Another Level's "Be Alone No More" Remix (1998) - Jay-Z's 25 Best Guest Verses on Remixes". Complex. Retrieved 2015-10-11. ↑ "Chart Stats - Another Level - Be Alone No More". Chart Stats. Retrieved 4 July 2010. ↑ "Soul Food | Release information | Phillip George & Anton Powers: Alone No More". Music-house.co.uk. Retrieved 2015-10-11.